Special report: Tando Resources, one of the best performing ASX resources floats of last year, is about to start a drilling program at its “SPD” vanadium project in South Africa. Tando (ASX: TNO) expects assay (lab test) results — due by the end of October — to underpin “strong newsflow over the coming quarter”. Initial “visual results” are expected as soon as this month. Tando was one of the ASX’s best performing small cap stocks last year. The stock, adjusted for a recent 4.6-to-1 split, has more than tripled since listing in November. It’s trading at 17c compared to an issue price of 4.3c (adjusted for a 4.6-to-1 split). The phase one program at the SPD project will comprise 18 holes for 1650m at the deposit, which now hosts a resource of 513 million tonnes at 0.78 per cent vanadium pentoxide (V2O5). Global vanadium projects categorised by resource grade and grade in concentrate. Drilling is aimed at converting the current “foreign resource” to the JORC Code. Tando is using two drilling rigs at the site so it can explore an existing high-grade resource as well as surrounding high-grade vanadium pipes at the same time. An initial mineral resource estimate is expected by the end of October. 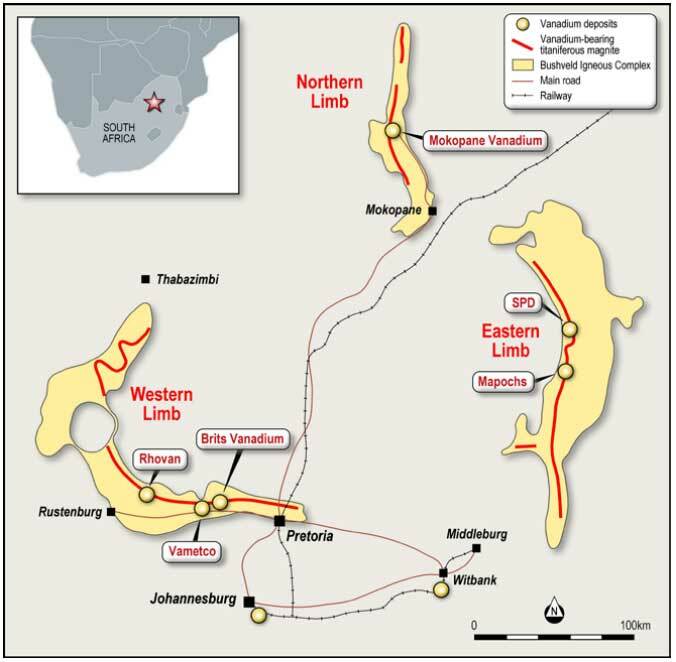 Tando’s “SPD” vanadium project and other vanadium deposits nearby in South Africa. Tando has already reported a host of high-grade vanadium assays from samples taken from the surface of the pipes with results consistently above 2 per cent V2O5. The grades suggest a “strong potential for the pipes to underpin a simple, low-cost, highgrade DSO operation with a compressed development timetable”, Tando says. DSO — or direct shipping ore — refers to minerals that require only simple crushing before they are exported, which keeps costs low. After the initial drilling results are received and a JORC resource established, Tando plans to move straight into a second phase aimed upgrading the resource to an “indicated” category. Mineral resources are typically categorised in order of increasing geological confidence from “inferred” to “indicated” to “measured”. By moving resources into the indicated category, it means a company has sufficient information on geology and grade continuity to support mine planning. The total cost for both phases is expected at about $1.4 million. The program is fully funded through to metallurgical and mining studies which will follow drilling. “We know we have extensive high-grade vanadium at SPD and that the value of the project will become clearer as we convert it to JORC status,” said Tando managing director Bill Oliver. This special report is brought to you by Tando Resources.